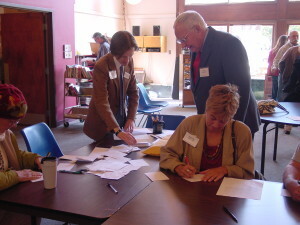 Congregation members writing to their Representatives. For an application to become an end-0f-life Vigil Volunteer, click here for Word format. Please click here to view as a pdf. For social justice service opportunities, click here. For a list of committees and contacts, click here. Office volunteers – assist in folding and mailings. Contact: Carol Marks. You do not have to be a member of the church to join in the service opportunities that are offered.